Start out traversing an old logging area and start climbing switchbacks just as you enter the forest. 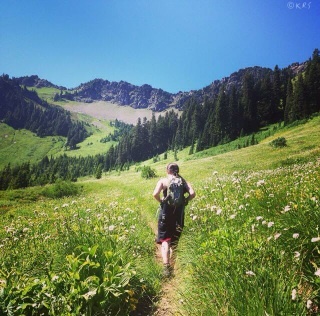 At about 3 miles, the trail opens to beautiful meadows as you finish the climb to the site of an old lookout. There are some campsites, but no fires allowed. This hike is on the southern facing side of the mountain, and therefore opens early in the season. Get there: Going east on Mount Baker Highway (542) past the Glacier Public Service Center about 5.5 miles. Turn left on Forest Service Road 3040 or East Church Mountain Road. The road ends about 2.5 miles up at the trailhead.